As the editors mentions in their afterword, birds are the creatures we see or hear most often in our lives. The poets featured are from the UK, Ireland, and the US. John Clare's work appears most often; as the poems are arranged ornithologically, Clare was clearly a keen birder. After a run of prize winning slim volumes by individual poets it was good to come to a substantial anthology on a single concrete topic. Yay, I thought, I am going to know roughly what these are all about.... and once I'd realised there was a 'notes' section at the end, mostly but not entirely ornithological, it was even better.It was an interesting way to gain a better understanding of my own tastes - there are inclusions from famous men that just left me cold and bored, thinking "Oh you do go *on*" John Clare, whose work appears more than any another, doesn't quite fit this category, for his close observation and relative lack of gushiness. I greeted each unsentimental Ted Hughes inclusion warmly, whether or not I recognised it as his. I especially enjoyed several poems in Scots (always good to be pushed into reading a poem aloud) and the poems about sparrows. I liked the way that rather than select a single poem per species, the greater propensity of certain species to inspire poetry was reflected.I feel the anthologists made a mistake in their criteria - most of the poems are about British birds or a British perspective (obviously including Coleridge's infamous albatross) but there's a scattering of North American birds and that just seemed to jar - there weren't enough to work. And there were very few about other parts of the world or in translation. So I feel they could usefully have been either more exclusive or much more inclusive.I was also a bit surprised at what didn't appear - wot no raven quothing "Nevermore"? What a great collection - and the notes (which I almost overlooked!) make it perfect. 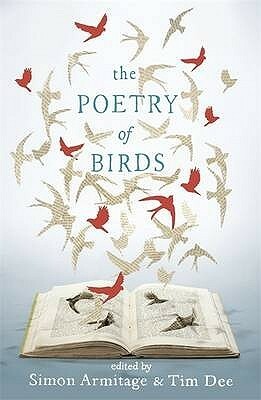 I like that the editors have given the more prolific bird poets (Clare and Hughes in particular) a louder voice than most; it makes complete sense, and although I remain ambivalent about the quality of Clare's poetry, it is perfect for this anthology. Simon Armitage offers some engaging thoughts in his afterword, and the book is thoroughly indexed and annotated. Anyone with a literary interest in birds (or an ornithological interest in literature) should pick up this book - they're bound to discover something new. Simon Armitage - Simon Armitage, whose The Shout was a finalist for the National Book Critics Circle Award, has published ten volumes of poetry and has received numerous honors for his work. He lives in England.Armitage's poetry collections include Book of Matches (1993) and The Dead Sea Poems (1995). He has written two novels, Little Green Man (2001) and The White Stuff (2004), as well as All Points North (1998), a collection of essays on the north of England. He produced a dramatised version of Homer's Odyssey and a collection of poetry entitled Tyrannosaurus Rex Versus The Corduroy Kid (which was shortlisted for the TS Eliot Prize), both of which were published in July 2006. Many of Armitage's poems appear in the AQA (Assessment and Qualifications Alliance) GCSE syllabus for English Literature in the United Kingdom. These include "Homecoming", "November", "Kid", "Hitcher", and a selection of poems from Book of Matches, most notably of these "Mother any distance". His writing is characterised by a dry Yorkshire wit combined with "an accessible, realist style and critical seriousness."